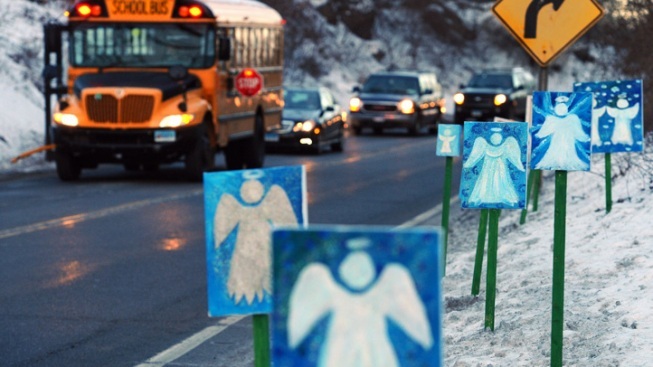 A bus traveling from Newtown, Conn., to Monroe stops in front of 26 angels along the roadside on the first day of classes for Sandy Hook Elementary School students after the Dec. 14 shooting, in Monroe, Conn., Thursday, Jan. 3, 2013. The state of Connecticut has approved the first round of funding for construction of a new Sandy Hook Elementary School building today. State lawmakers have set aside $50 million to help Newtown build a new school to replace the one where a gunman killed 26 people last December. Over the summer, the commission unanimously approved allocating $750,000 for the design of the building. Today, the State Bond Commission voted in favor of the first allocation, $3.7 million, toward construction of a new building. Gov. Dannel Malloy previously said in a statement that the state is pledging its support and was prepared to approve the funds. Newtown First Selectman Pat Llodra thanked lawmakers who backed approving the funds on behalf of the town. “This support enables our community to move forward with the right and best plan for schooling 450 grades K-4 students who were so impacted by the horrific violence that took the lives of 20 first graders and six educators. Having these funds available eases our journey in recovery and helps us grow in confidence for a bright future,"Llodra said in a statement. Friday’s meeting begins at 10:30 a.m. in Room 1E of the Legislative Office Building in Hartford.